Hoary Morning - Cooking Apple Tree £12.75 - Dual Purpose Apples Apple Trees and Fruit Trees For Sale. Buy at competitive prices with wholesale discounts. Hoary Morning is an old Somerset variety dating back to the early 1800s. 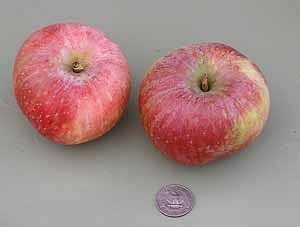 It is a particularly beautiful apple, with bright pink and crimson stripes over golden yellow. The name refers to the soft hoary appearance on the skin, like that of a peach. It has a sweet, rich flesh and will keep its shape when cooked, making it a useful dual purpose apple. It also has excellent disease resistance making it popular with organic growers, and if stored correctly will keep through to the spring.